It was on time to update my Longest reigns (current monarchs) page tonight. Following the death of King Bhumibol Adulyadej (Rama IX) on 13 October 2016, I had planned to wait for the formal proclamation of the designated heir, Crown Prince Vajiralongkorn, but as that has been put on hold for the time being, the website had to be updated. There will soon be another change to the list, as the King of Malaysia (Yang di-Pertuan Agong) Abdul Halim Mu'adzam Shah ibni Sultan Badlishah, the Sultan of Kedah, currently no. 22 on the list, will step down on 13 December 2016 to be succeeded by the Sultan of Kelantan, Muhammad V, b. 1969, following the election by the Conference of Rulers on 14 October 2016. According to the Constution of Malaysia Article 32 third paragraph, the Yang di-Pertuan Agong (Head of State) is elected by the Conference of Rulers for a term of five years. The Conference of Rulers (Majlis Raja-raja) is formed by the nine rulers of the Malay states (nine out of 13 states) which have hereditary royal rulers). Normally the Timbalan Yang di-Pertuan Agong (Deputy King/Head of State) is elected as the next king, and that is what happened here, as Muhammad V (Tuanku Muhammad Faris Petra) of Kelantan has served as Deputy King since 2011. The next Deputy King will be the Sultan of Perak, Nazrin Muizzuddin Shah, b. 1956. This means that unless something happens in in Thailand before 13 December, the new King of Malaysia will enter the list as no. 29. while the monarchs of Tonga, Andorra (on of the Co-Princes, that is), The Netherlands, Qatar, Belgium, Spain and Saudi Arabia will go one place up (from 22nd to 28th). By the way, no. 8, the Sovereign Prince of Liechtenstein, Hans-Adam II, b. 1945, is on the list as he still is the reigning Prince and head of state, even if Hereditary Prince Alois, b. 1968, has served as Regent since 15 August 2004. This might deserve a footnote on the Longest reigns website, but that can wait until December. Prince Hans-Adam II succeeded to the throne of the Principality of Liechtenstein on 13 November 1989 upon the death of his father, Prince Franz Josef II. 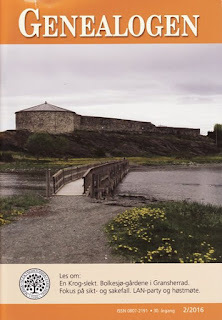 The latest issue of Genealogen, the newsletter of Norsk Slektshistorisk Forening (The Norwegian Genealogical Society), arrived in my mailbox today. 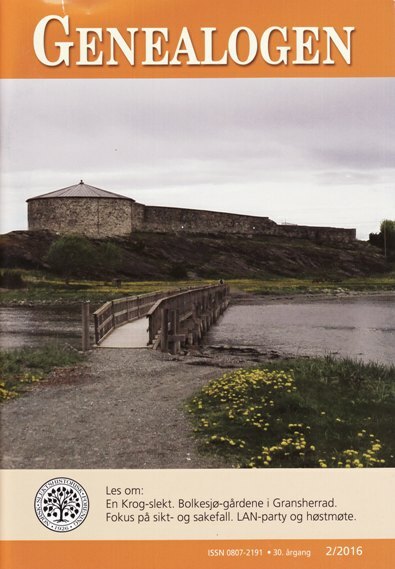 On the front cover there is a photo of Steinvikholm Castle at Skatval in Stjørdal municipality north of Trondheim. My contribution this time is a short (2 pages long) presentation of New England Historic Genealogical Society, the oldest of its kind in the United States. I have been a member since early spring this year, and I visited the society's headquarters in central Boston in early August. Unfortunately there was no room for the photos I had provided for the article, but I will instead include them when I in the not too distant future write a presentation of the society for Slektshistoriewiki, the Norwegian Genealogy Wiki. Manhaffte korporal Niels Christensen Krog ca. 1658–1733 by Petter Vennemo (about one of the Krog families in Norway). Bolkesjø-gårdene i Gransherad («The Bolkesjø farms in Gransherad [Telemark county]») by Odd Arne Helleberg. Sikt- og sakefallslister i lens- og amtsregnskapene på 1600-tallet (an introduction to lists of fines paid to the king for various crimes in the 17th century) by Rune Nedrud, who is also chairman of the Norwegian Genealogical Society as well as head editor of the newsletter. Landsturnstevnet og Trøndelagsutstillingen i Trondheim 1930 – og to flybåter i svenske farvann (about the finding of old negatives, which among others included the national gymnastics meeting and the Trøndelag Fair in Trondheim in 1930, and we get some insight into the author's Berg family too) by Carsten Berg Høgenhoff, editor of Genealogen. Bot og bedring?, a book review by Johan Marius Setsaas of Olof Holm et al. Böter och fredsköp. Jämtlands och Härjedalens saköreslängder 1601–1645, Landsarkivet i Östersund och Jämtlands läns fornskriftsällskap, Östersund, 2016. Norwegian Death Index (NDI), an introduction by its database owner and editor Kjell Arne Brudvik. In addition you will find the minutes as well as an article about the annual meeting, which took place in Trondheim in May this year and a list of books donated to the society's library during the period May–October 2016. Not to forget the ad for Genea-LAN, the social gathering for genealogists which take place in the weekend of 19th and 20th of November. 28 hours with non-stop genealogical research, in addition to lectures, a «DNA corner», competitions and much more. It is the fifth time the LAN party takes place, probably the first of its kind! The front cover of Eurohistory. 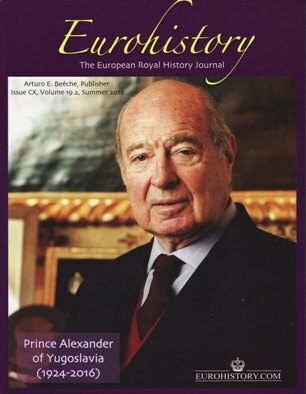 The European Royal History Journal, Issue CX, Volume 19.2, Summer 2016, has the portrait of Prince Alexander of Yugoslavia, who died on 12 May 2016, 91 years old. The editor and publisher of the magazine, Arturo E. Beéche, has written a rather personal and well-written obituary. The opening article has the subject title Claremont and Britain's Most Important Room and is written by Katrina Warne. Claremont is the residence where Princess Charlotte of Wales died, a sad event that of course changed the course of royal history of the United Kingdom. Many royals have spent shorter or longer time at Claremont, and Warne gives a good summary of the residence, which today houses a school. The next one out is the article Crown of Tears by Shelby F. Morrison. The article gives an outline Queen Marie Antoinette of France and Empress Alexandra Feodorovna of Russia, whose lives ended in tragedy. Ilana D. Miller then continues her Who Is in the Photograph series, this time the focus is on Three Greek Beauties: The Daughters of Prince Nicholas of Greece, i.e. Princess Marina, later Duchess of Kent, Princess Elizabeth, later Countess of Toerring-Jettenbach and Princess Olga, who married Prince Paul of Yugoslavia and became the mother of among others Prince Alexander mentioned above. Marina and Olga are both fairly well-known, while less has been written about Countess Elizabeth. Maybe someone could take the task of writing more about both the countess and the family she married into? The third and last part of the article Princess Augusta of Cambridge, Grand Duchess of Mecklenburg-Strelitz by Marlene Eilers Koenig tells the story of the last years of the British-born princess. Despite being British through and through, her annuity was suspended in September 1914 as she was a German subject by marriage. A «politically correct» decision, perhaps, but perhaps a bit harsh. Besides the obituary of Prince Alexander of Yugoslavia, Arturo E. Beéche has also written the obituary of Prince Johann Georg of Hohenzollern, who died in Munich, Germany on 2 March 2016, 83 years old. There are three book reviews in the current issue. Martijn Arts presents the Eurohistory book From Tyranny to Freedom ... Memoirs of My Life by Countess Viktoria Luise of Solms-Baruth, who first was married to Prince Friedrich Josias of Saxe-Coburg and Gotha and secondly to Richard C.B. Whitten. Schloss II. More Fascinating Royal History of German Castles by Susan Symons (Roseland Books, Cornwall, 2015, ISBN 9780992801410. I bought a signed copy in connection with the Royal Gatherings conference in the Hague last year, by the way. The third volume was published earlier in 2016. Maria Pia. Queen of Portugal by Sabrina Pollock (Eurohistory.com, 2016, ISBN 9780985460372). Finally the readers are treated by Royal News, this time covering the Imperial, Royal, Princely or noble houses of Austria, Spain, France, Hohenzollern, Luxembourg, Liechtenstein, Colloredo-Mansfield, Fugger von Babenhausen, Hohenlohe-Bartenstein, Alba and Ligne. For earlier articles on the magazine, please go here, while the ERHJ blog can be read here. I came over the grave of brazier (gjørtler) Carl Peter Larsen (1827–1925) during my visit to Our Saviour's Cemetery (Vår Frelsers gravlund) today. The grave plate also shows the name of his wife Hanna Severine Larsen, née Soelberg (1829–1900) and their daughter Vally K. Larsen (1858–1931). The latter worked as a teacher, according to the 1885 national census. A brazier is a person (craftsman) who works brass. In the cemetery register Larsen is actually listed as a gjørtlermester (brazier master). While the grave plate only shows three names, the cemetery register tells that grave no. 01.026.04.007 is leased (festet) together with grave no. 01.026.04.008 and that all in all 8 persons are buried there. I didn't notice any Larsen headstone next to the grave plate. Some of the other five are listed in the 1865 national census. There could have been more children, of course. If the details above are correct, Hanna must have been around 47 when Thorstein Emanuel was born. It seems a bit old, but not impossible. One has to go through the church books to find more details and to double-check everything. Maybe another time. 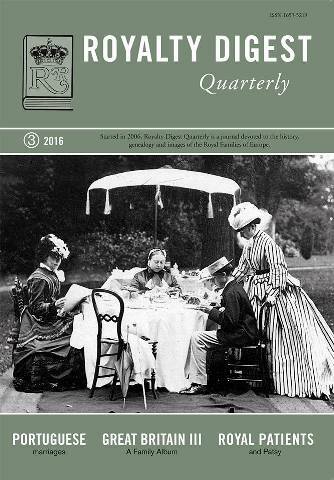 In his Editor's Corner in the latest issue of Royalty Digest Quarterly (no. 3, 2016), Ted Rosvall comments on the increasing number of divorces within the European Royal Families. The lastest out is the separation of Princess Märthan Louise of Norway and Ari Behn, announced by the Norwegian Royal Court in August 2016. In the 19th century royal divorces were «extremely scarce», as Rosvall points out. He has made a list of the examples he could think of, 12 in all. On the front page the readers are served a photo of Queen Victoria in the mid-1960s surrounded by (from the left) the Crown Princess of Prussia, Princess Beatrice, Prince Leopold and Princess Louise. The opening article, Mariana Vitoria and the Royal weddings in Portugal in the 18th Century, is written by Alberto Penna Rodrigues. Portuguese royalty is a topic he knows well, and it is a well-written, very detailed and interesting article, even if it could have been somewhat better organised. The Mariana Vitoria (Maria Anna Victoria) (1718–178) in question was the eldest daughter of King Felipe V of Spain and Isabel Farnesio. She was first engaged to King Louis XV of France at the age of seven (!) and later married to the future King João V of Portugal. I have earlier several times written how much I like to read articles about «royal surroundings» and not only the royals themselves: Nannys, court members, private teachers (tutors) etc. Another way of learning more about the royals and the royal court in question. The second part of Charlotte Zeepvat's article 'My dearest Patsy'. A nurse and her royal patients was as interesting as the first part. The nurse Elizabeth Paterson, née Stuart gave a helping hand in connection with many royal births, and we learn a lot about both her and the royals in question through an impressive amount of letters. The readers are also treated with the third part of Charlotte Zeepvat's The Royal House of Great Britain and Ireland. A Family Album. Besides the introduction, the article includes 106 portraits/family group photos besides a photo of Balmoral. Queen Victoria even smiles on one of the photos! The two pages mapping out the descendants of james VI of Scotland and I of England are most useful. Queen Anne of Romania, née Princess of Bourbon-Parme, died on 1 August 2016, and the historian Diana Mandache has written her obituary. Romania is also the topic in the article Half a Century of Royal Letters; 1899-1946. Collected by John Wimbles from the Romanian National Archives and other sources, compiled and introduced by David Horbury. So many wonderful letters! I just loved it. Give us more! Finally, the latest issue gives us royal news through the column The World Wide Web of Royalty. This time we get news from the Imperial, Royal and/or Princely (or ducal) families of Denmark, Hohenlohe, Leiningen, Romania, Sweden and Westminster. The death of Gunnila Bernadotte, Countess of Wisborg, is included. The short note says she had three children with her first husband, while she had in fact four, but this was not well known outside family circles when the magazine went to print. Grave of Else Werring. née Wilhelmsen (1905–1989), who was Mistress of the robes (overhoffmesterinne) at the Norwegian Royal Court from 1958 to 1985, and her husband, shipowner Niels Roth Heyerdahl Wering (1897–1990), at Haslum kirkegård (cemetery) in Bærum, grave no. 02.112.00.014. Queen Sonja of Norway's brother Haakon Haraldsen died on 4 October 2016, 95 years old, cf. among others the NTB article published on Aftenposten.no 13 October 2016 and the death announcement in Aftenposten the same day. The funeral service took place at Holmenkollen Chapel on 14 October 2016. Queen Sonja, King Harald, Crown Prince Haakon, Princess Märtha Louise and Princess Astrid, Mrs. Ferner attended the service, cf. the NTB article published on Bt.no today. Originally King Harald was invited to lay the foundation stone for the new Munch Museum in Bjørvika in Oslo today, but because of the funeral service, his daughter-in-law Crown Princess Mette-Marit went in his place. Haakon Haraldsen, who was one of the sponsors («godparents») to Princess Märtha Louise, was born at Josefines gate 23 in Kristiania (now Oslo) on 22 September 1921 as the eldest son of (clothes) store manager Karl August Haraldsen (1889–1959) and Dagny Haraldsen, née Ulrichsen (1898–1994). Besides the future Queen of Norway, Karl August and Dagny also had the children Gry Dagny (1924–1970) and Karl Herman (1929–1936). The latter died in a boat accident, see my blog article from 2011. Haakon Haraldsen married on 14 December 1957 in Denmark Lis Ingeborg Elder from Rungsted (Aftenposten 13 Desember 1957 no. 578, p. 13). They had 3 children – Karl Otto, Lis Dagny and Marianne – as well as 6 grandchildren. Haraldsen worked for the most part with property management, first of all through his company AS Karl A. Haraldsen, but was also registered as manager and/or chairman (of the board of directors) of the companies Storgaten 10 A AS, Haakon Haraldsen Holding AS and Haraldsens Eiendomskontor AS (AS = Ltd.). As Haakon Haraldsen lived at Vettakollen in Oslo, which is in the parish of Ris, it is expected that his last resting place will be Ris urnelund (Ris urn garden). The ashes of his parents, his sister Gry, his aunt Hanna Alice Haraldsen (1887–1971), uncle Halvor Haraldsen (1893–1970) and aunt Inger Elisabeth Haraldsen, née Rydgren (1904–1994), are all interred at Ris.